How can we rethink ideas of policy failure to consider its paradoxes and contradictions as a starting point for more hopeful democratic encounters? 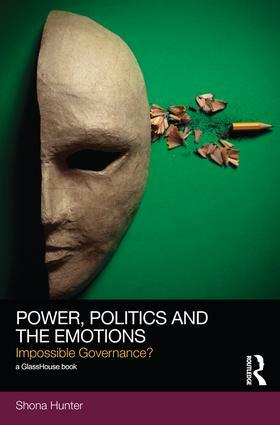 Offering a provocative and innovative theorisation of governance as relational politics, the central argument of Power, Politics and the Emotions is that there are sets of affective dynamics which complicate the already materially and symbolically contested terrain of policy-making. This relational politics is Shona Hunter’s starting point for a more hopeful, but realistic understanding of the limits and possibilities enacted through contemporary governing processes. Through this idea Hunter prioritises the everyday lived enactments of policy as a means to understand the state as a more differentiated and changeable entity than is often allowed for in current critiques of neoliberalism. But Hunter reminds us that focusing on lived realities demands a melancholic confrontation with pain, and the risks of social and physical death and violence lived through the contemporary neoliberal state. This is a state characterised by the ascendency of neoliberal whiteness; a state where no one is innocent and we are all responsible for the multiple intersecting exclusionary practices creating its unequal social orderings. The only way to struggle through the central paradox of governance to produce something different is to accept this troubling interdependence between resistance and reproduction and between hope and loss. Analysing the everyday processes of this relational politics through original empirical studies in health, social care and education the book develops an innovative interdisciplinary theoretical synthesis which engages with and extends work in political science, cultural theory, critical race and feminist analysis, critical psychoanalysis and post-material sociology. This book will surely come to be recognised as a landmark on the long road towards putting a loving, suffering, struggling subject at the centre of social policy. Psychoanalysis meets Foucault in this hugely ambitious account of the state’s melancholic entanglement with social difference. Fail again. Fail Better! - Paul Hoggett, Emeritus Professor of Social Policy, UWE, Bristol. Shona Hunter's book offers a welcome reframing of theories and practices of governing. Rather than repeating the failures of a focus on state and institutions as abstract entities, Hunter draws on feminist psychosocial perspectives to open up a focus on the relational politics of governing. Grounded in case studies of everyday practices and experiences, this book highlights the 'impossibility' of conventional governing and explores possibilities for renewal and reparation. - Janet Newman, Emeritus Professor, Open University. By foregrounding the 'feeling work' that characterises the daily practices of state agencies, their staff and their users, Hunter demonstrates with supreme skill and intellectual adroitness the power of feminist, psychosocial analysis to unlock and make meaningful the social, historical, cultural and psychic forces in and through which our subjectivities and collective belongings are made. - Gail Lewis, Reader in Psychosocial Studies, Birkbeck College, University of London. Shona Hunter is a Lecturer in Sociology and Social Policy Governance at the University of Leeds, England and a Research Associate at the Research Centre into Visual Identities in Architecture and Design at the University of Johannesburg, South Africa. Within a broad geopolitical and intellectual landscape, this new, theoretically engaged, interdisciplinary series explores institutional and grassroots practices of social justice across a range of spatial scales. While the pursuit of social justice is as important as it has ever been, its character, conditions, values, and means of advancement are being radically questioned and rethought in the light of contemporary challenges and choices. Attuned to these varied and evolving contexts, Social Justice explores the complex conditions social justice politics confronts and inhabits – of crisis, shock, and erosion, as well as renewal and social invention, of change as well as continuity. Social Justice is intended as a critical interdisciplinary series, at the interface of law, social theory, politics and cultural studies. The series welcomes proposals that advance theoretical discussion about social justice, power, institutions, grass-roots practice and values/ ethics. Seeking to develop new conversations across different disciplines and fields, and working with wide-ranging methodologies, Social Justice seeks contributions that are open, engaging, and which speak to a wide, diverse academic audience across all areas of the law, social sciences and humanities.